Property 4: New apartment (renovated), views of the sea (100m). New and elegant apartment in Viserba di Rimini, a stone's throw from the sea! Property 33: New and elegant apartment in Viserba di Rimini, a stone's throw from the sea! 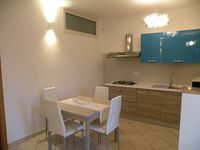 Room with large terrace in Rimini a few steps from the sea: completely new! Property 34: Room with large terrace in Rimini a few steps from the sea: completely new! Property 50: Apartment new residential area, 4 people, 2 steps from everything. Lovely Apartment With a View! My sister, my husband and I stayed in Rimini in July. We have all traveled internationally quite extensively and I can honestly say Angela is one of the nicest people you will ever meet; gracious, accommodating and a responsive host. She truly is one of the best hosts you will ever have the pleasure of meeting!! From the moment we rented the apartment, she went over and above assisting us with helpful information about Rimini and the surrounding Italian Riviera, making dinner reservations for us, even making arrangements to pick us up at the train station! She made herself available to us during our entire stay and made sure our every need was met! When we arrived to the apartment, Angela had stocked the fridge with Prosecco, fruit, juice and milk as well as providing crackers, snacks and other treats for us. The apartment itself is very lovely, very bright and airy, with large windows overlooking the river. The bedrooms are very comfortable and the bathroom is very nice. Lots of nice towels and linens. The apartment has a beautiful beachy ambiance, was spotless, and had everything we needed for our stay. The location is great, very convenient for walking to the town, the fishing village, and the train station. We regret that our stay was so short! Thank you again Angela for such a wonderful time and for making our visit to Rimini so memorable! !